It is official, I am 100% back into beach-y decor mode! It seems as though I have taken a short break, enjoyed Christmas andddd now I am ready to get back to the beach. Now if only this Wisconsin weather would work with me on that one! Don’t get me wrong, I am having a great time enjoying the big huge ice skating rink in my backyard, but boy would I rather be swimming in that lake! Maybe another reason why I am SO edited for the warm weather is that we will be closer to meeting our little baby bean! 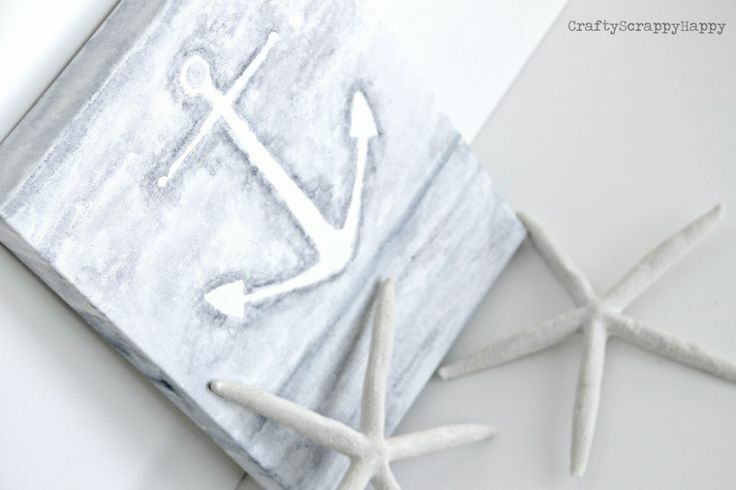 But since the summer weather is months away, I will stick to beach crafting to get me excited! Since I am not naturally amazing at painting, I grabbed my good old watercolors for this project and just painted on top of a vinyl adhesive of an anchor that I had around from a different project. After I had the watercolor just right I took the vinyl off of my canvas, and this is what I have. A super simple watercolor canvas that reminds me of the summer! If you want to know more about how to start a craft business check out this article. I am still debating if I should add words…. what do you think? !